VH-JET#1 & Her Sisters - Why V-Jet? 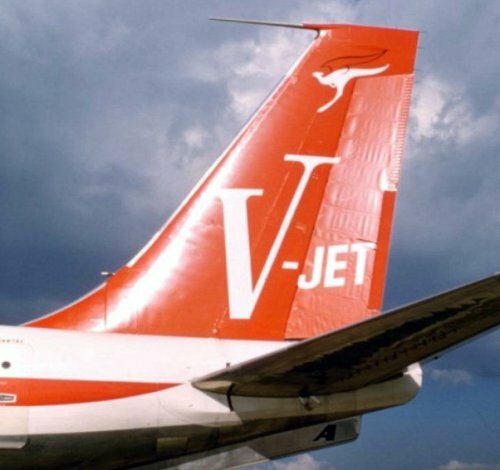 V-Jet is a marketing name which was introduced by Qantas soon after the introduction of the Boeing 707-138B with turbofan engines. 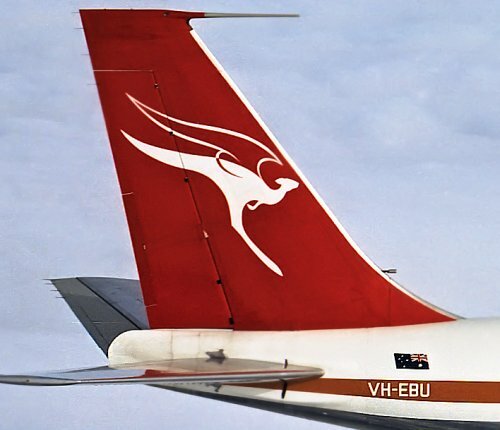 The first Qantas 707 to be built with turbofan engines was VH-EBH which was delivered to Sydney on 6 August 1961 wearing a modified version of the original 707 livery. Aircraft VH-EBI, VH-EBJ and VH-EBK were also delivered in this interim livery. Aircraft VH-EBL and VH-EBM were delivered in the V-Jet livery. Progressively, aircraft VH-EBA to VH-EBG were retrofitted with turbofan engines and repainted in the V-Jet livery. 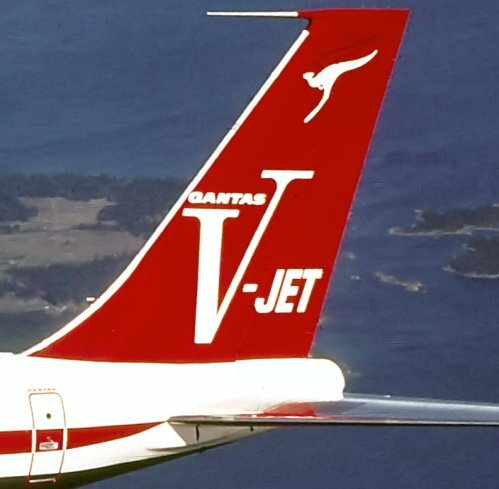 The first Qantas drawing (Number SY-A1651) of the V-Jet livery was dated 31 July 1961. 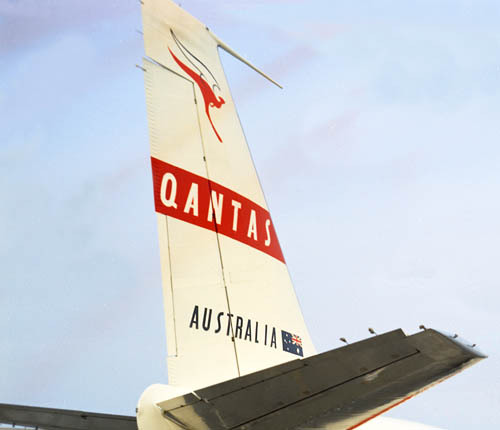 Subsequently, the word QANTAS was incorporated into the V-Jet design with a drawing amendment dated 15 July 1964. The original tail markings as carried by VH-EBA to VH-EBG inclusive. 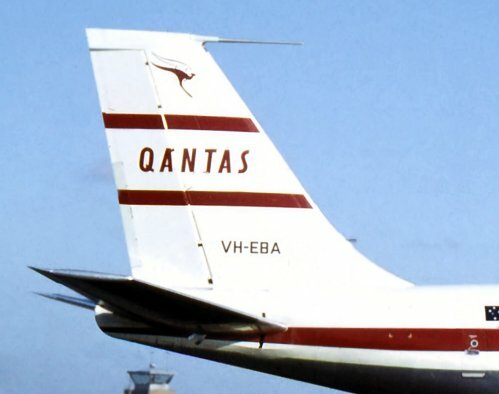 The interim tail markings as carried by VH-EBH, VH-EBI, VH-EBJ and VH-EBK. 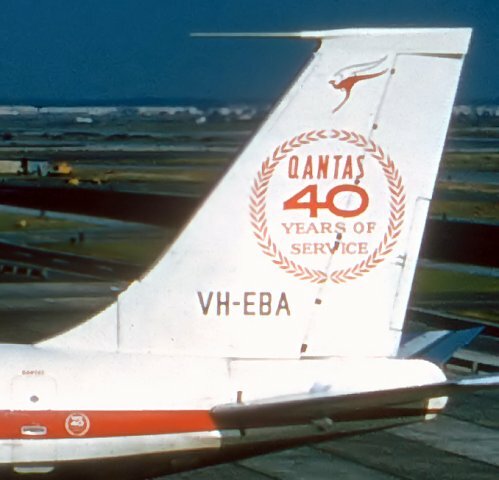 The 40th Anniversary tail markings as carried by several aircraft in 1960. 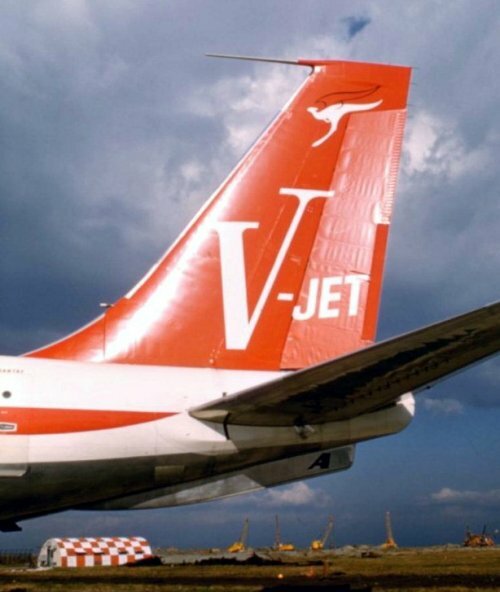 The first V-Jet livery which was introduced in July 1961. VH-EBL and VH-EBM were delivered in this livery which was applied retrospectively to all 707-138B. The modified V-Jet livery with the incorporation of QANTAS into the V-Jet design. This variation was introduced in July 1964 and applied progressively to all 707-138B. All 707-338Cs were delivered in this livery. The ultimate ochre livery carried by all 707-338Cs remaining in service. None of the 707-138Bs carried this livery. Greatly expanded to show all variations in tail markings.